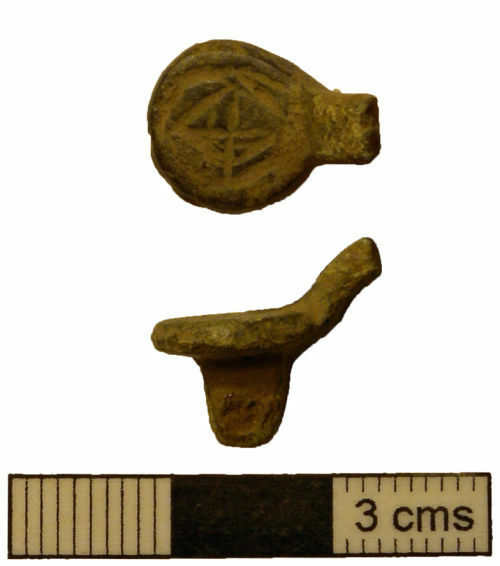 A fragment of a Middle Saxon ansate brooch, comprising the circular terminal and part of the bow. The terminal is engraved with a cross within a lozenge within a circle. There is a double pin lug with an iron spindle on the reverse. It may be compared with Hübener 1972 Gruppe I, and Thörle 2001 Gruppe II 1c, and is close to an example from Canterbury (ibid. Taf.13.10). It is 11mm wide and dates from the 8th century.